For that true luxury getaway where you just want to unwind and relax in beautiful scenery, Mataranka hot springs is for you. Located on the North side of Australia in Elsey National Park, you will be surrounded by forests as you soak in several different thermal springs while viewing natural wildlife and waterfalls. This is a great piece of paradise in Australia that will make your vacation even more memorable. 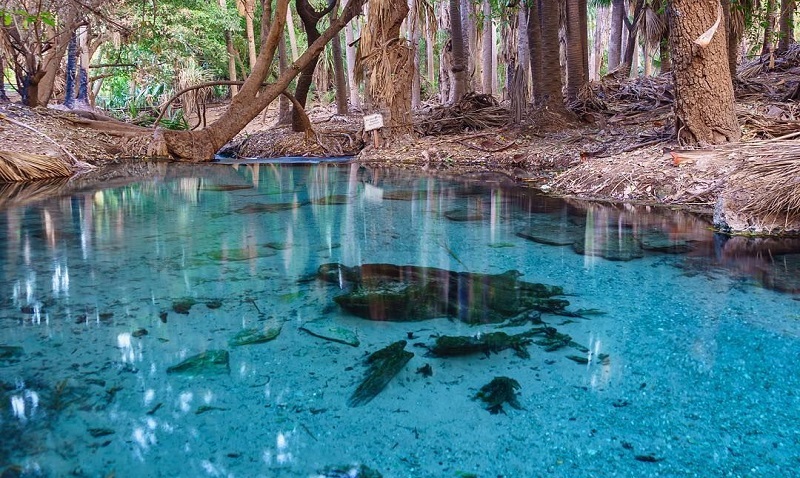 There are two popular thermal pools to enjoy, with Mataranka being the more popular of them all. Although it can sometimes get crowded in the busier seasons, it’s large enough that you’ll never feel cramped and can go on a scenic walk if needed and come back when it empties out a bit. 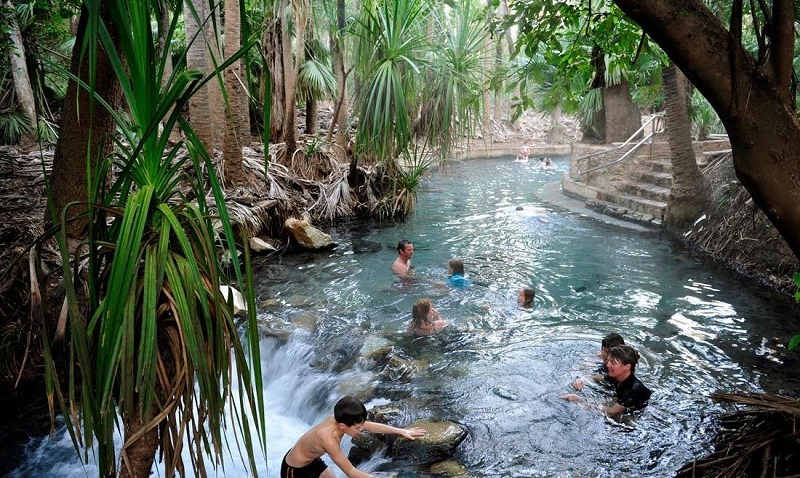 The hot springs is always pumped in by natural spring water that comes from the Daly. Take some time and explore Mataranka peninsula as there are various trails that will take you to waterfalls, gardens, and wildlife to explore. For another piece of paradise, Bitter Springs is not to far away and gives you a little more seclusion if that is what you prefer. 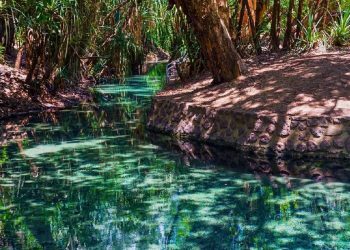 This natural spring is almost like a river with a current that gives you the option of hopping on a tube and enjoying a float while you take in the scenery of Elsey National park. There are also some great walking paths that take you over a bridge as you tour the area. If you are lucky you may catch some wildlife or even some turtles enjoying Bitter Springs with you. 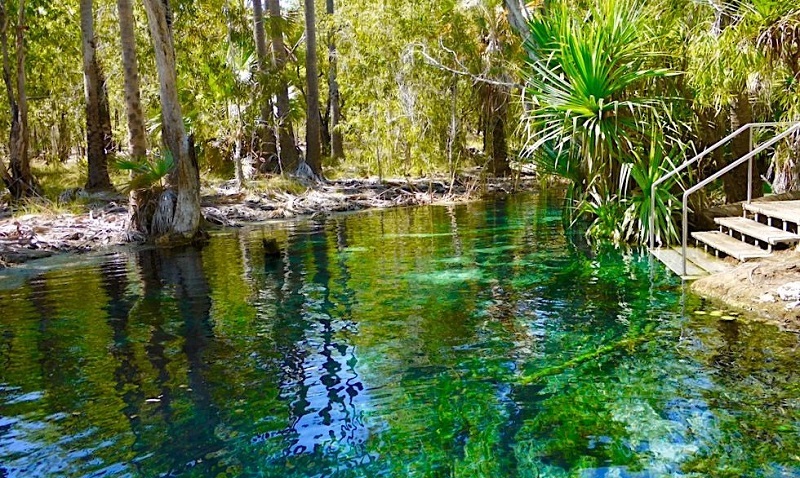 Elsey National Park does have a plethora of attractions outside of Mataranka Springs and Bitter Springs. If you are there just for the thermal pools there are a few hiking trails that only take a short while before returning to relaxation. If you are more adventurous there are various hikes along the Roper river to scenic views and points of interest. It’s definitely worth the time as you wonder through the forest and get a sense of what Australia is all about. If you do roughly a 4km walk you’ll eventually come across Mataranka Falls as the river quickly changes from a nice slow speed to falling off a cliff into Tufa Dams. There are several great campgrounds and hotels to say in the area. Booking ahead of time is important as it can get rather busy during the peak seasons. Also several sections have been closed off due to alligators in the area, but the places still open are definitely safe for families and kids. 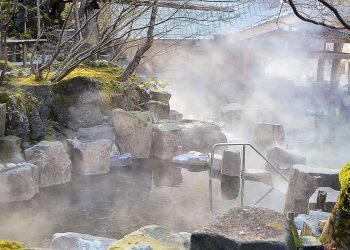 With quite a few renovations in the last several years, Katherine hot springs has become a popular destination to unwind after a long day in Northern Australia. 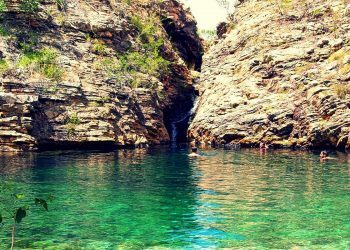 Located next to Katherine River, their crystal clear pools along with campgrounds, picnic area, and scenic trails gives this place a unique experience.